Hello Kirsti: Our latest project arriving August 2016! Our latest project arriving August 2016! 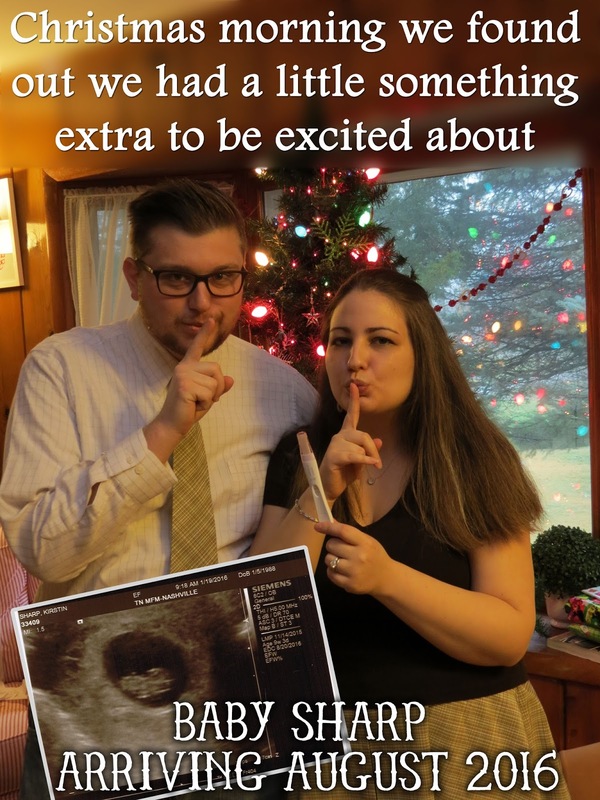 Christmas morning Andrew and I found out we had a little something extra to be excited about... Baby Sharp arriving August 2016! So far I've been super lucky in my how I've been feeling! We're now at 17 weeks and other than a couple of weeks of super sleepiness at the end of the first trimester I've been feeling great! Lots of nursery planning and baby sewing posts to come! Here's a outake from our Christmas morning photoshoot with the 'big sister' kitties. To tell our parents I sewed baby carriage ornaments with "August 2015" on the reverse since we found out on Christmas morning. It made for a great reveal! We also got super lucky and were in Maryland in late January for a friends wedding so we were able to tell my parents in person! In fact it was the same weekend as the worst blizzard in over 10 years... but luckily we were able to safely get in and out of DC safely. For our announcement to our parents I also sewed a Winnie the Pooh romper for everyone to have their photo taken with after finding out. This Pooh toile was my first 'baby fabric' purchase! So sweet! I added a "S" applique in corduroy to give it some extra interest. To it create I used this free pattern from Sleeping is for Sissies which worked out really well. I'll definitely be whipping up a few more of these!